The Community Performance & Art Center is under the management of the Community Performance & Art Center Foundation through a lease agreement with Pima County. The Center consists of six buildings totaling over 25,000 sq. ft. on approximately 4.5 acres with panoramic views of the Santa Rita Mountains. Award winning and internationally acclaimed designer, Antoine Predock, shaped the Performance & Art Center to resemble mountains with peaks and valleys while preserving the natural beauty of the surrounding Sonoran Desert. Each building is diverse in character and function. The Performance & Art Center consists of a dance studio, music studio, art gallery, theatric set construction building, reception room, dressing rooms, administrative offices, performance theater, rooms for instrument storage and a sheet music library. 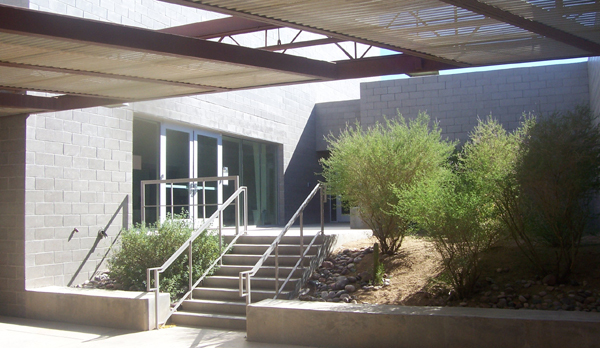 Adjacent to the Performance & Art Center is the Learning Center, managed and operated by Pima Community College. The Performance & Art Center has provided and will continue to make accessible Arts programming of exceptional quality to all socio-economic levels through affordable presentations of music, dance and theater. As the visibility of CPAC extends further into surrounding communities, the ability to provide regional and national performers will dramatically increase. The axiom of “build it and they will come” is tempting to embrace yet the Foundation is not so naive. Success for the new Community Performance & Art Center will come through diligence, partnerships, sound financial planning, volunteerism and the support of surrounding communities. Currently, CPAC serves the surrounding communities through several opportunities each year: As a community focal point for the Arts, the Arts Center proudly presents over 60 multidisciplinary performances and it hosts more than 40 performing groups from Tucson, Quail Creek, Amado, Nogales, Sahuarita, Rio Rico, Oro Valley, Phoenix and Los Angeles yearly through rental of the Center. Twenty to thirty regional organizations each year rent CPAC for meetings, conferences, special events, fundraisers and social events. The art gallery showcases over a dozen exhibitions a year. The Foundation is neither selective nor inclusive to the arts for rentals of the facility but does give priority to arts organizations from the surrounding communities. As per our agreement with Pima County, the Performance & Art Center must be affordable and accessible to all individuals and groups.